For our December star-of-the-month feature, we will focus on old Hollywood stars who passed away in 2014. First up is Lauren Bacall. Lauren Bacall burst onto the scene in the 1940s as a new kind of leading lady: A sultry, sassy woman of the world who could hold her own against any man. In To Have and Have Not (1944), her unique beauty and idiosyncratic mannerisms -- dubbed "The Look" by the Warner Brothers publicity machine --beguiled audiences and her co-star and future husband Humphrey Bogart in equal measure. Bacall's film career waxed and waned in the coming decades, but she was always a sophisticated and elegant presence onscreen. Lauren Bacall demonstrating "The Look." Bacall was born Betty Joan Perske on Sept. 16, 1924 in the Bronx. Bacall's parents divorced when she was young and she and her mother, Natalie, went to live in Brooklyn with her mother's extended family. Natalie dropped Perske as a last name for both herself and her daughter and reverted to her maiden name Bacal (Bacall later added the extra "l" because people were always mispronouncing her last name. Her first name was changed from Betty to the more glamorous Lauren when she was put under contract by Warners. Bacall always hated the name Lauren and friends and family called her Betty throughout her life). This cover photo for Harper's Bazaar launched Lauren Bacall's Hollywood career. Bacall was working as a fashion model when director Howard Hawks' wife, Slim, spotted her on the cover of the March 1943 edition of Harper's Bazaar. The Hawkses saw great potential in the 18-year-old beauty so they bought her a train ticket to Hollywood where she was given a seven-year contract from Warner Brothers. Hawks then set about turning Bacall into a movie star. He particularly focused on her voice: Hawks required that she read aloud for several hours a day to deepen her already naturally low speaking voice. Bogart and Bacall in To Have and To Have Not (1944). 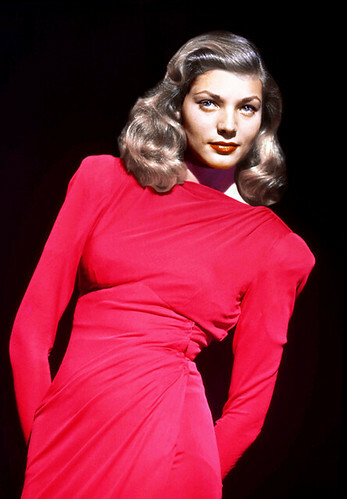 Bacall won the lead role in Hawks' adaptation of Ernest Hemingway's novel, To Have and Have Not. Her co-star was Humphrey Bogart, then at the height of his fame after coming off his huge success in Casablanca (1942). Bacall, an inexperienced 19 year old, was terrified as she recalled in her autobiography. "My hand was shaking, my head was shaking, the cigarette was shaking, I was mortified," she wrote. Bacall realized that if she lowered her head and looked up at Bogart, she could steady herself. That idiosyncratic mannerism came off as confidence onscreen and was played up by Warners' studio publicists as "The Look." 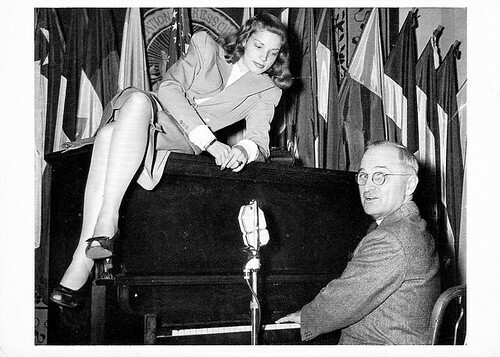 Lauren Bacall with then Vice President Harry Truman in 1945. No doubt this photo landed him in some hot water with Bess. Bacall became an overnight sensation when To Have and Have Not was released. Young women everywhere copied her clothes, hairstyle and makeup in an effort to achieve "The Look." Bacall's profile was further heightened when she was photographed sitting on top of a piano that was being played by Vice President Harry Truman. Bacall was visiting the National Press Club in Washington D.C. when an overeager publicist coaxed her on top of the piano. The photo caused a minor scandal and no doubt landed poor Harry in some hot water at home. By this time, Bogart and Bacall were in love. Their romance began on the set of To Have and To Have Not, but there were complications. Bogart was 25 years older than Bacall and he was still married to his third wife Mayo Methot. Bogart and Methot were known as "the battling Bogarts" for their drunken, crockery-throwing brawls (as one wag put it, "the Bogart-Methot marriage was the sequel to the Civil War"). Bogart divorced Methot in February 1945. 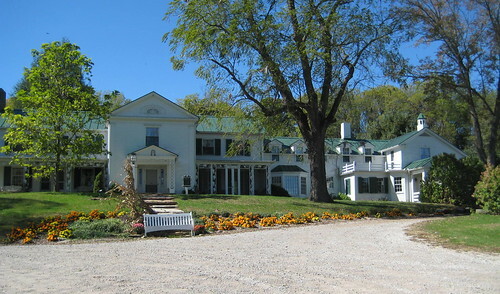 On May 21, he married Bacall in Ohio at the home of his close friend, the writer Louis Bromfield. Here's newsreel footage of the ceremony. 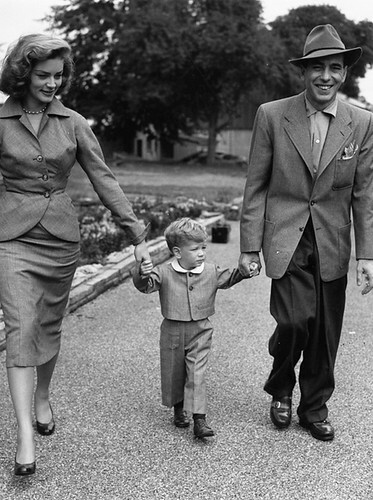 Bogart and Bacall with their son, Stephen. Warners immediately re-teamed Bogart and Bacall in The Big Sleep (1946), a film noir featuring Bogart as detective Philip Marlowe and Bacall as yet another femme fatale with a guilty secret. Bacall appeared in a few films in the next several years--most notably Dark Passage (1947) and Key Largo (1948) with Bogart and in Young Man with a Horn (1950) with Kirk Douglas -- but she mostly concentrated on being a wife and mother. Bacall with Betty Grable (left) and Marilyn Monroe in How to Marry a Millionaire (1953). Bacall revived her film career in the mid-1950s. Although Bacall never regained the impact she had in her earlier films, she made several fine movies in this period. Her comeback role was as gold digger Schatze Page in the musical comedy How To Marry a Millionaire (1953). Bacall's best role was in Written on the Wind (1956), director Douglas Sirk's melodrama about a family of oil magnates. Bacall also appeared in two films directed by Vincente Minnelli: The Cobweb (1955), features Bacall as a therapist in an upscale psychiatric clinic and Designing Woman (1957) is a fun romantic comedy about the fashion industry co-starring Gregory Peck. 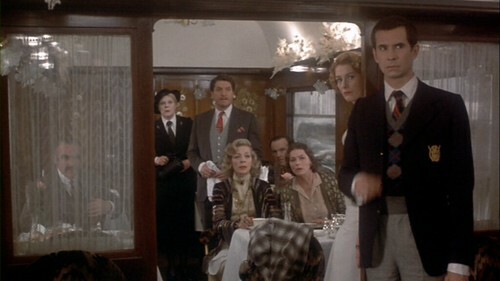 Bacall (center) starred in Murder on the Orient Express along with (from left to right) Rachel Roberts; Denis Quilley; Colin Blakely; Ingrid Bergman; Vanessa Redgrave and Anthony Perkins. After Bogart's death, Bacall moved back to New York. She rarely appeared onscreen throughout the 1960s, 1970s and 1980s, preferring to focus on her thriving stage career (she won two Tony Awards) and her writing (she won the National Book Award in 1978 for her autobiography, By Myself). She appeared in a few all-star vehicles, such as Murder on the Orient Express (1974), but her most notable role was in John Wayne's last film, The Shootist (1976), where she plays the landlady of a dying gunfighter (Wayne). Lauren Bacall in The Mirror Has Two Faces (1996). 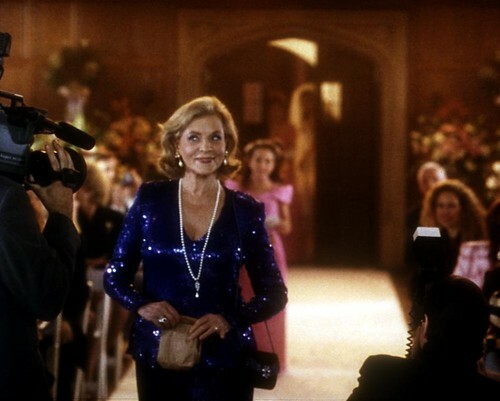 Bacall's film career revived again in the 1990s. She was nominated for an Academy Award for Best Supporting Actress for her role as Barbra Streisand's pushy mother in The Mirror Has Two Faces (1996). She also made more adventorous choices, appearing in two of Danish auteur Lars von Trier's films: Dogville (2003) and Manderlay (2005). Her last film role was the voice of the Grey One in the animated feature Ernest and Celestine (2012). 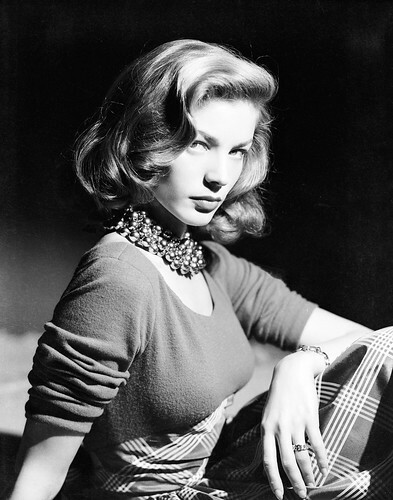 Bacall died of a stroke on Aug. 12 of this year at the age of 89. Sources for this article are By Myself by Lauren Bacall, Bogart: A Life in Hollywood by Jeffrey Meyers and the Bacall's New York Times obituary.